Snake Tracks! There is nothing quite like seeing the sinuous lines left behind on the ground by snakes. Serpents around the world strike people with strong feelings, ranging from awe and fascination to sheer terror. 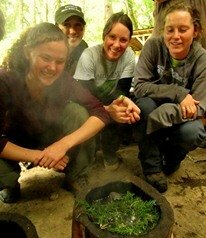 To understand the snake tracks you find, you must first take time to understand how snakes move. 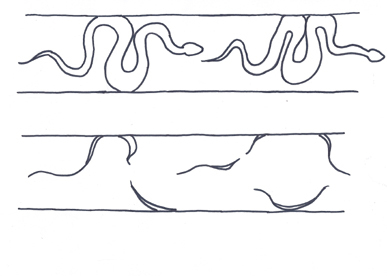 Each of these will be described in detail below and have an accompanying drawing to show how the snake moves and what tracks it leaves behind. Being creatures without limbs, snakes move in very unique ways. Although most snake species can at some point use all 5 methods of movement, most species will mainly utilize 1 or 2 forms of locomotion. 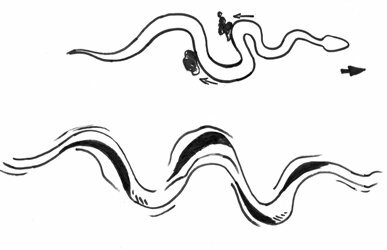 Also, under certain situations snake tracks can show a combination of 2 different types of locomotion being used by a snake at the same time. 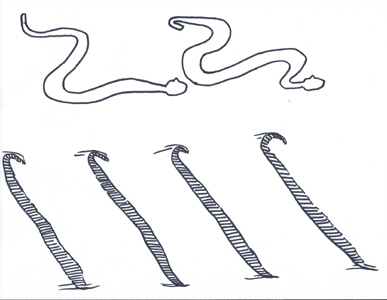 Notice that for each of the following 5 modes of snake locomotion, there are diagrams to help demonstrate the snake's body movement and what the tracks look like for each. The shaded areas in the drawings are where the body pushed the most forcefully against the ground. This is the form of motion probably most familiar to people as the classic snake movement and also the most classic snake tracks. 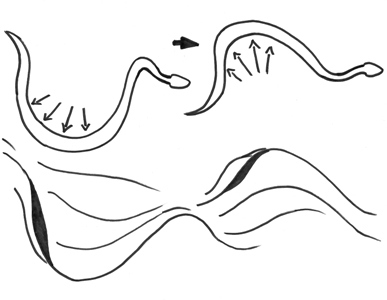 In lateral undulation, waves of muscular motion travel down the length of the snake's body towards the tail. As they come in contact with an object - such as a stick, plant stem, stone or piece of uneven ground – the part of the body nearest that object exerts force against that object, and deforms locally around it. As the snake pushes against multiple objects, the overall motion of the animal will be forward. During this type of locomotion, the snakes belly scales also act on the substrate below the snake and help grip, as the snake attempts to push forward. So, even on relatively smooth substrate, many snakes can still effectively move forward because of the added traction from their belly scales. This form of movement leaves a different set of tracks altogether. This form of motion involves the snake pulling up the body into bends and then straightening out the bends. It is called concertina after the instrument, and this motion has a very similar quality of movement to a concertina or accordion contracting and expanding. This form of locomotion is most efficient in narrow tunnels, passages or when climbing. These kinds of tracks are rarely seen, as they general require substrate to be present between narrow spaces. This type of movement leaves uniquely wide, broad tracks. The motion consists of the serpent pushing its body forcefully in very large undulations in a sliding sideways motion that moves the body widely across a surface. This generally occurs when the snake is disturbed or frightened while on a smooth surface, and it attempts to quickly escape. 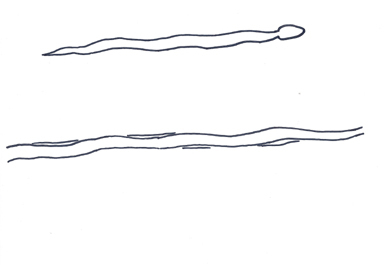 The snakes body pushes down with enough force to move the body forward a little bit at a time. This movement is usually done with the rear half or two-thirds of the snakes body. This is perhaps the most famous kind of snake track out there. It is certainly the most dramatic in appearance. This form is used by many types of snakes when crawling over smooth, slippery or unstable surfaces. The snakes best known for this kind of motion are the sidewinder rattlesnakes and the Middle-eastern and North African vipers species that live in areas of extensive sand. In this motion, the snake sends a wave down the body such that the body rolls from head to tail and portions of it are lifted off the ground as the body moves. The track is relatively proportionate to the length of the snake. 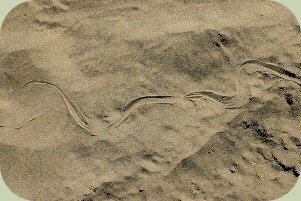 This is one of the more efficient methods of movement over loose sand, especially for shorter, heavier bodied serpents. If the substrate is fine, and the tracks are relatively fresh, you may see the marks from the belly scales. This is only possible because the snake is moving its body sideways. If it moved forward, it would erase the marks left by the belly scales. 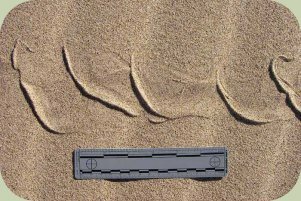 This form of motion leaves snake tracks that are in more or less a straight line. This type of movement is used mostly by larger and heavier bodied snakes. It is used especially in areas of relatively open ground. In this motion, the snake uses its belly scales as the main source of traction. It moves by first lifting the belly scales slightly from the ground and pulling them forward, and then pulling them downward and backward. This movement is similar in appearance to the slow, flowing walk of a caterpillar. In this movement, the tracks will not likely show any belly scales as the snake is sliding forward and covering up all the of the scale details. Snakes are fascinating animals, with incredibly graceful and beautiful movements. Seeing snake tracks laid out on the ground before you can be almost as exciting as seeing the animal itself. There is no better way to learn about tracks than to watch how live snakes move. If you have snakes in your area, go find one and observe it. Pay attention to how they move. If you don't have snakes in your area, go visit a local zoo or reptile house.